Hurry on over and get a free sample box of Suave products from Walmart. 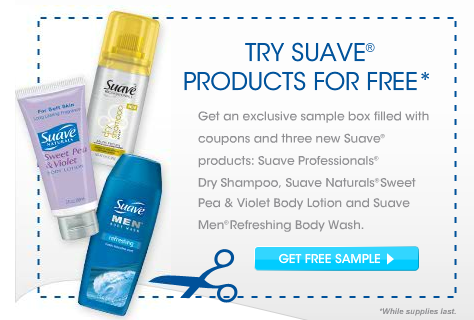 This freebie will contain samples of three new Suave products: Suave Professionals Dry Shampoo, Suave Naturals Sweet Pea & Violet Body Lotion, and Suave Men Refreshing Body Wash. You’ll also receive coupons for Suave products. Offer good while supplies last. Thanks to Freebies 4 Mom for the tip! Can’t wait to see how Suave products compare to salon brands!